None; Do not include a wiring harness - I will be responsible for all wiring and relays. The Arrington Performance Competition 1500 Fuel hat was designed for the extreme enthusiast. For HEMI engines running stroker engines sprayed with high shots of nitrous, high boost capable turbocharger systems, or high boost superchargers, this twin fuel hat system provides a complete in tank solution. By upgrading your HEMI fuel system you can support your current setup and prevent starvation if additional modifications are made. Arrington Performance’s new HEMI fuel pump assembly allows a HEMI owner to add two Walbro 465 intake fuel pumps without custom fabrication of your chassis or fuel tank. The multi pump setup, when accompanied by the API Fuel Hat Wiring Harness, runs only a single pump until additional fuel pressure is needed. When the secondary pump engages an indicator light notifies the driver that the secondary pump is on. In the event of a primary fuel pump failure the secondary fuel pump plug can be swapped at the hat allowing the driver to get home safely without a tow. This pump switching design and the no contact O-ring isolated floating pump allows for quiet single pump operation under normal driving conditions with the flexibility of a dual pump setup when large amounts of fuel are required to maintain fuel line pressure. Arrington Performance incorporates only the highest quality fuel rated parts and electronics. Each competition 1500 fuel hat is CNC machined in the USA from billet 6061-T6 aluminum. Installation of the competition 1500 fuel system requires installation of a complete supply line, an external fuel pressure regulator, upgraded fuel rails, and a high grade wiring harness like the optional API Fuel Hat Wiring Harness. This unit also requires modification to your factory supply line for use as a return fuel line. The Arrington Performance Billet Fuel Hat has been tested for use in Gen 3 HEMI applications up to 1500 RWHP. Beyond that level of power you will need our triple fuel hat which will be released soon. 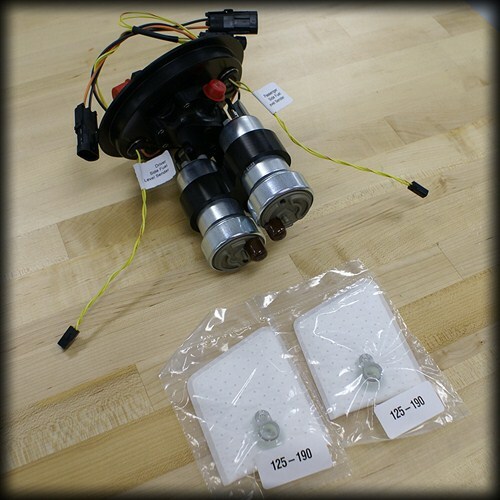 This kit comes with everything needed to add 2 Walbro 465 LPH (F90000267) Turbine fuel pumps to your Mopar fuel tank, while retaining your stock fuel tank and siphon basket. By utilizing the best components of the original OEM fuel tank and return assembly and improving on its weaknesses the Arrington kit maintains a high level of efficiency, allowing the system to safely maintain pressure on cars up to 1500 RWHP. If you have questions about installing this HEMI part, please refer to our Competition 1500 Fuel Hat Installation Guide. NOTE: THIS KIT DOES NOT INCLUDE THE STOCK FUEL TANK OR STOCK SIPHON BASKET. Under the high fuel consumption conditions experienced under racing or high acceleration in cars with power adders can become lean or starved for fuel resulting in a potentially dangerous loss of fuel pressure. The Competition 1500 multi pump fuel hat, when accompanied by the API Fuel Hat Wiring Harness will help prevent these issues and prolong engine life. If your Challenger or LX Charger, Magnum, or 300c experiences this condition under wide open throttle it may cause your fuel pump(s) to burn out, or worse it could result in a lean air fuel ratio- leading to engine damaging starvation. If your pump burns out on the road you could be stuck waiting for a tow truck. With the API competition 1500 Fuel Hat and Wiring Harness, a simple field repair can be done with no tools allowing you to get to a shop or garage without the expense or hassle of a tow. 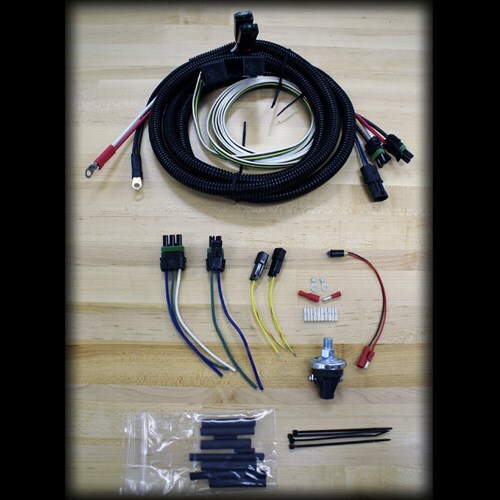 This heavy gauge wiring harness makes installation even easier and provides the much needed functionality some of our competitor’s kits lack. This wiring system replaces your small diameter OEM wiring, which was not designed to handle the electrical draw from a multiple pump setup. The harness includes the in tank retrofit kit to allow utilization of the factory fuel siphon. 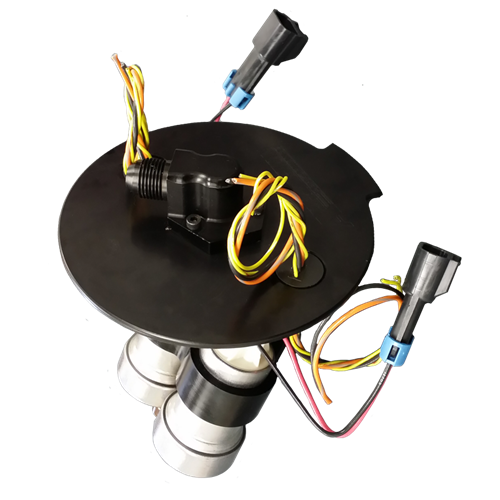 In addition to the parts and pieces for in tank installation, the harness includes an indicator light that can be mounted in the driver’s line of sight. This light illuminates when the second fuel pump is activated by a Hobbs switch. This system also allows for a quick field repair requiring no tools should the primary pump fail during operation. Caution! - Modifying your fuel system without the proper knowledge, tools, or precautions can be dangerous! Fuel level must be below 1/8 tank before beginning the installation process to avoid overrun. Check your area before you begin the installation process. Remove any open flames such as cigarettes or pilot lights. Install only in a well-ventilated area. DO NOT install inside of a standard garage or with the vehicle doors closed to avoid inhalation of toxic gas fumes and risk of explosion. DO NOT smoke in the installation area. Fumes and a small amount of fuel may be released when servicing the pump, basket or connections. In order to reduce the risk of personal injury, cover any fittings with a shop towel before disconnecting to catch any fuel that may leak out. Place the towel in an approved container when the job is complete. Engine recalibration devices can modify fuel and spark curve (including, but not limited to programmers) and are recommended when changing the pressure or volume of fuel delivered to the engine. Improper use of these programmers may cause engine damage or failure. Arrington Performance is not responsible for engine or consequential damages.